Diversity and abundance make Tropical North Queensland unique as a food-producing region. Some of it is familiar but flag flyers for the tropics include mangoes, bananas and sweet, sun-ripened pineapples, reef fish and wild-caught prawns. Less well-known are the rainforest nuts, fruits and native spices that Aboriginal people gathered from this land for millennia, and today appear in local markets and on restaurant menus. In the highlands of the Atherton Tablelands, you’ll find coffee and tea plantations and cattle farms, biodynamic dairies producing milk, cheese and yoghurt, aquaculture farms and distilleries. Grab a map and DIY a bespoke food trail, or join an organised food tour to talk and taste bush food with an Indigenous expert. A wander around the markets at Yungaburra or Rusty’s Market in Cairns also offers the opportunity to see, smell and taste the tropical north. If you prefer your produce plated up rather than hunted and gathered, a melting pot of cultures and the region’s proximity to Asia ensure that Tropical North Queensland’s dining scene is a vibrant, multicultural smorgasbord – from Italian cafes to Balinese diners. 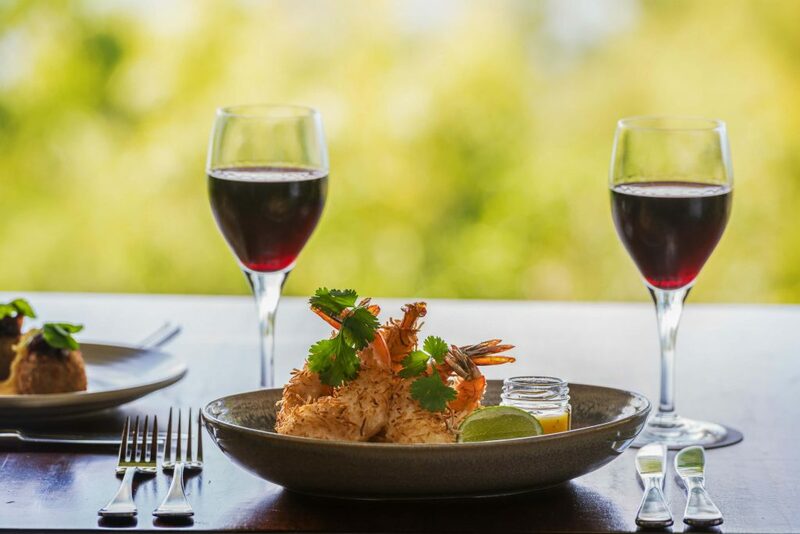 Other restaurants proudly showcase their local roots, with native Australian produce like kangaroo, emu and crocodile on the menu and some of the best seafood in the country, caught locally. With a profusion of experiences and produce, whatever your interests and appetite, you’re unlikely to ever go hungry up here. Food trails, bush tucker and eating out in Tropical North Queensland.